20 Dec Exterior Cleaning: DIY or Hire a Pro? Are looking into exterior cleaning for your home or commercial property but don’t know if you should DIY or hire a pro? Home exteriors are directly exposed to weather conditions such as rain, snow, and wind, but also to debris, falling leaves, and soot. These factors can make even the newest of homes look dull and dirty. This is why, once in a while, every property needs a good cleaning on the outside to look like brand new. But this is a huge task that warrants some special consideration. For instance, if you have the time and necessary help, you can roll up your sleeves and spend a weekend cleaning the walls, gutters, roof, and windows. On the other hand, people who are busy or would like a more thorough clean, hire a professional cleaning company. Keep reading to discover if you should do the cleaning yourself or hire professionals to do the job. Before you start working, ask yourself if you have the necessary experience and knowledge for this task. Cleaning exteriors may seem easy, but it takes a certain level of expertise to tackle different parts of the house. 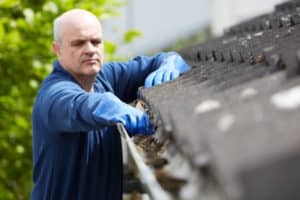 There’s also the safety factor, as you’ll need to climb up the ladder to clean the roof and gutters. Professional cleaners can do the job faster, safer, and reach areas you’d otherwise miss. Exterior cleaning surfaces are very different than those inside the home. Outside, you’ll find stubborn stains from exposure to the elements, debris from trees, animals, mildew, rust, and smog. You can remove some of the dirt easily, but you’ll need a stronger cleaning solution or a pressure washer for the rest. A professional cleaning company will know which cleaning agent and how much pressure to apply to a particular surface to avoid damage. When you’re cleaning your house exterior by yourself, you’ll need a number of items like brushes, pressure washer, cleaning products, ladders, protective clothes and shoes, and in some cases, a respirator. If you do have all these things at disposal, you can easily finish the job. If you don’t, you’ll either have to buy them or simply hire a cleaning company that will supply all the equipment they need. If you don’t have the needed equipment and cleaning agents for the job, think how much you’d need to spend. Compare that to hiring professional cleaners and see which is more affordable. When you hire a company, you’re also saving hours’ worth of time and effort on your end. The cleaning crew will clean up everything after themselves, so all you have to do is admire your spotless home exterior. Now that you know the pros and cons of cleaning the exterior of your home by yourself, it’s time to get to work. If you don’t have the time and equipment needed for this task, we at Prowash Nashville would love to help you out. Contact us today to get a free quote!